Back in November, it appeared Android 5.0 was heading out to the unlocked version of the second generation Motorola Moto G. But the update was pulled and only a few Moto G owners received it. Now, Android 5.0.1 is reportedly being sent out to the Motorola Moto G, and based on information gleaned from those who have received the update, both the OG and second generation of the phone are receiving the latest build of Google's open source OS. One lucky second generation Motorola Moto G owner says that Android 5.0.1 came as software version 22.21.25, with build number LXB22.46-25. 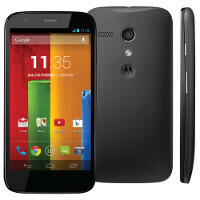 The OG Motorola Moto G is said to be receiving software version 220.21.25, with build number LXB22.46-25. If you own either model, remember that these updates are sent out on a staggered basis. You might receive it today, tomorrow, the next day or even a few days later. Stay calm and collected. You can attempt to manually check for the update by going to Settings >About phone >System updates > Check for updates. Nice move? My unlocked 2013 Moto X still doesn't have Lollipop. WTF is wrong with this picture Motorola? Hurry the hell up. It's Motorola. Are you surprised? Read the article. You will not get 5.0. You'll get 5.0.1 directly. Be patience. Its just started. What about Moto G 4G? Would really like to try Lollipop on my wife's 4G as my Xperis SP won't even get Kitkat without root. notice how the second generation moto G has in the "System version" something like "RETUSA", meaning it's the Retail USA version. But in the OG it names something like Asia Retail... Wouldn't that mean that screenshot is from an Indian user? Waiting for my Moto g Lollipop..
Btw, once you get 5.0, you can't downgrade. Keep that in mind cause the future might hurt. Explain "downgrade". I tested LP GPe on my S4 and was able to restore back to KK. I guess it has something to do with the bootloader? I have a unlock moto g 2nd gen. Still no lollipop. I have no no high hopes either. Update is already out and being pushed, stop being ridiculous. Hey guys, your carrier is the one to blame. They're the ones managing the updates from Google not Motorola or Google. Nothing here on 2nd gen Moto G either. I've only had this one abt a week but I had asked Motorola should I be concerned that it still says up to date on KitKat. They said no of course, & until I just read this I didn't even know that only a few got 5.0 and it was pulled..? Motorolas website makes it seem as though it's still rolling that out too. OK. I take it back... I just got the Lollipop update on my Moto G 2nd.